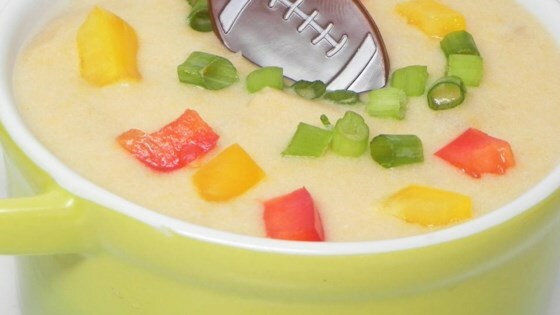 "This beer-based, yummy soup is perfect for the boys on a day of football." Melt the butter in a saucepan over medium heat; cook the onion and garlic in the butter until the onion is tender, about 5 minutes. Pour in the Worcestershire sauce and beer; bring to a boil for 3 to 5 minutes. Stir the chicken broth and mustard. Reduce heat to medium-low and pour in the half-and-half while stirring. Toss together the shredded Cheddar cheese and flour in a bowl; add to the liquid mixture in small batches until melted. This was delicious and came out perfectly following the quantities and directions as found here. It's a keeper for sure! I have tried a lot of different recipes for this soup and this is the best! Everyone I pass it on to loves it! Enjoy! Very easy to make with little mess in the kitchen. Needed a little more zing, so I added a pinch of cayenne pepper. Really nice!